Anna Michelle Lawing (Ph.D. Geological Sciences and Biology, Indiana Univ., 2012) developed methods to synthesize general circulation climate models, phylogenetics, species distribution modeling, morphology, and ecometrics to understand how species and communities respond to their changing environments. Part of this work involves ongoing development of new methods for modeling the evolution of multivariate systems (e.g., multidimensional climatic niches, genetic covariance matrices, and morphological shapes) and to reconstruct their phylogenetic changes. The paucity of methods to simultaneously deal with covariance and the non-independence of species and traits hampers ecological and evolutionary analysis. Multivariate systems with high dimensionality and complex correlation structures are a fundamental component of phylogenetics, quantitative genetics, climate change biology, ecology, and paleontology. will continue my research endeavors at Texas A&M University in the Department of Ecosystem Science and Management in College Station, TX as an Assistant Professor of Spatial Sciences. 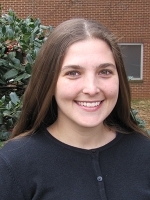 Upon completing her fellowship at NIMBioS, Dr. Lawing accepted a position as assistant professor of spatial sciences in the department of ecosystem science and management at Texas A&M University, College Station, TX. Rodder D, Lawing AM, Flecks M, Ahmadzadeh F, Dambach J, Engler JO, Habel JC , Hartmann T, Hornes D, Ihlow F, Schidelko K, Stiels D, Polly PD. 2013. Evaluating the significance of paleophylogeographic species distribution models in reconstructing Quaternary range-shifts of Nearctic chelonians. PLoS ONE, 8(10): e72855. [Online]. Lawing AM. January 2013. Using the past to inform future expectations of species response to climate change. The Convergence of Conservation Paleontology and Biogeography Plenary Symposium, 6th International Biogeography Conference, Miami, FL. Minority-serving Institution Partner Visit 2013. Invited to speak at University of Texas El Paso, visited with faculty and students to strengthen ties between this minority serving institution partner and NIMBioS. Society for the Advancement of Chicanos and Native Americans in the Sciences Annual Conference, San Antonio, TX. October 2013. Invited to speak to undergraduate minorities in the sciences. Adventures in STEM, Knoxville, TN. June 2013. Invited to speak at this science, math, and engineering camp for middle school girls. Girls in STEM, L&N High School STEM Academy, Knoxville, TN. March 2012. Invited to speak at launch event for female students in high school. UT study: Turtles may have trouble adapting to climate change. WUOT Radio. North American turtles losing their habitats to climate change. Reptile Channel. Slithering away: A warming planet displaces snakes' habitat. Mathematics of Planet Earth 2013 blog. Turtles on the run as habitats shift and sink. Red Orbit.